From February next year (2019), lorries meeting the latest Euro VI emissions standards will be eligible for a 10% reduction in the cost of the Heavy Goods Vehicle (HGV) levy. The cleanest lorries generate 80% less nitrogen emissions than dirtier ones. Those lorries that do not meet the latest emissions standards will be expected to pay 20% more. "This government is committed to improving the air we breathe and delivering a green revolution in transport. "Heavy goods vehicles account for around a fifth of harmful nitrogen oxide emissions from road transport, but they only travel 5% of the total miles. "That’s why we’re changing the HGV levy to encourage firms to phase out the most polluting lorries and bring in the cleanest ones." The HGV Road User Levy, introduced in 2014, was brought in as a first step to ensure lorries pay a charge to cover the greater wear and tear they cause to road surfaces than other vehicles. This change to the levy will further incentivise the industry to choose less polluting lorries. When the change comes into effect, more than half of UK vehicles will pay less. 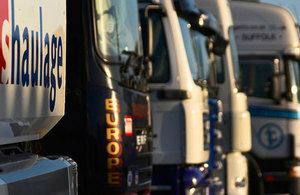 As increasing numbers of companies move to cleaner lorries, the UK haulage industry overall will pay less. "Air pollution has improved significantly since 2010, but we recognise there is more to do which is why we have put in place a £3.5 billion plan to improve air quality and reduce harmful emissions. "Poor air quality affects public health, the economy, and the environment, and all motorists, including hauliers, must play their part if we are to clean up our air for the next generation." The HGV levy is just one element of the government’s £3.5 billion programme to clean up the air and reduce emissions, which includes £255 million for councils to improve air quality and a dedicated Clean Air Fund of £220 million for those local areas with the biggest air quality challenges.